Dympna Hammil who had a lucky escape when a recently installed gas boiler leaked carbon monoxide. also included is Deputy Mayor of ABC Council, Councillor Paul Duffy. INPT31-224. 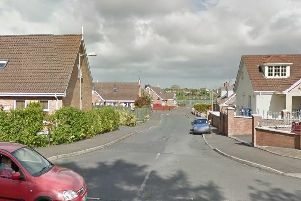 Four people were treated in hospital this week after a suspected gas leak was reported on Monday afternoon in Portadown. The Northern Ireland Fire and Rescue Service were called to Obins Drive at around 4.16pm and sent two appliances from Portadown and one from Lurgan to deal with the suspected leak. A spokesperson said firefighters wearing breathing apparatus used monitors to check for carbon monoxide, however, all readings were zero. “The boiler had been isolated by a Firmus engineer prior to the arrival of Fire Crews. Grandmother Dympna Hoey said she was shocked when a man who was looking into an issue with her gas called the NI Fire and Rescue Service after apparently high readings. She said she had been concerned for her health and that of her family following the initial reading. A spokesperson for the Housing Executive said: “Carbon monoxide detectors are fitted to all our properties that have a gas heating system installed. “We were very concerned that the tenant thought their gas boiler was malfunctioning and that carbon monoxide was being released into the property. “We immediately carried out a joint inspection with our contractor. “The Health and Safety Executive and a representative from Gas Safe were present. “The contractor carried out a number of checks,” said the spokesperson. “The contractor confirmed that there were no immediate issues with the tenant’s heating system and that there are no risks to occupants in the property in relation to carbon monoxide. “We can also confirm that the tenant’s boiler was fitted and inspected by a Gas Safety Registered engineer. “To provide a greater level of assurance to the tenant we have installed a new carbon monoxide detector in the property. Sinn Féin Councillor Paul Duffy called on the NIHE to inspect all homes to ensure detectors are working properly.